What started as light-hearted banter on social media turned into a real storm for Chelsea loanee Tiemoue Bakayoko as the AC Milan ace apologised to Francesco Acerbi. It began after Lazio defender Acerbi suggested that his side had the stronger squad compared to Milan’s, with the two Italian giants going head-to-head for a Champions League qualification spot. As seen below, Bakayoko decided to have fun with it ahead of their encounter on Saturday night, with Milan securing a crucial 1-0 win to move clear in fourth place and deal a real blow to Lazio’s hopes in the process. Ok ACERBI see you Saturday ?? However, that’s where things began to escalate it seems as after swapping shirts following the full-time whistle, Bakayoko and teammate Franck Kessie were seen holding Acerbi’s shirt up to the Milan fans in a mocking way, as seen in the tweet below, which raised concerns over the pair showing a lack of class. As noted by Calciomercato, it was suggested that the FIGC were then set to get involved in the matter with Bakayoko and Kessie threatened with the possibility of a ban, or more likely a fine. That would be disastrous for Milan and coach Gennaro Gattuso, but it appears as though the issue has been resolved between the players at least as seen in their tweets below. 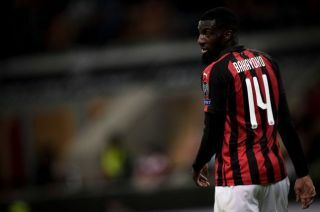 Bakayoko initially apologised for his behaviour after the game, insisting that it was not meant to be disrespectful, but just a continuation of their banter online. It seems as though his apology has had the desired effect though, as Acerbi tweeted on Sunday evening, suggesting that he’s ready to put an end to the issue too and called for the controversy to stop. It remains to be seen if that’s enough for the FIGC to drop their involvement in the matter, but Bakayoko will probably be well advised to avoid repeating this kind of thing in the future as he awaits to see whether or not Milan make his move from Chelsea permanent this summer. As noted by Goal.com, the Frenchman joined the Rossoneri on an initial loan deal, but a €35m option to buy has been included in the agreement, and so it remains to be seen if he does enough to warrant a permanent move.